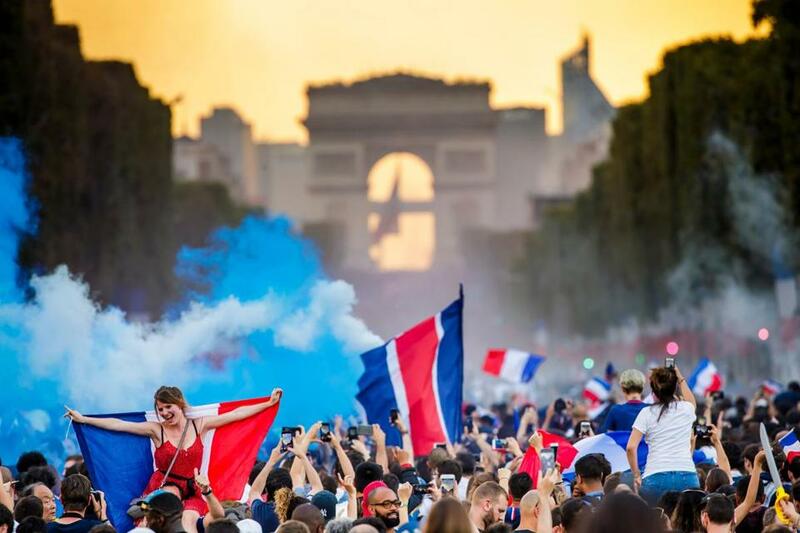 French supporters celebrated on the Champs Elysees their team&apos;s victory after the FIFA World Cup 2018 final match between France and Croatia. PARIS (AP) — It was a victory for all of France and the home crowd did it justice, pouring into Paris’ Champs-Elysees Avenue by the tens of thousands to celebrate in an explosion of joy. France’s 4-2 win over Croatia in the World Cup final in Moscow on Sunday marked the second time in 20 years that France has won the World Cup, and came at a time when the people feel needy. ‘‘It represents enormous things,’’ said Goffrey Hamsik, dressed in a hat resembling a rooster — the French national symbol — and a shirt with the No. 10 for Kylian Mpappe, the 19-year-old breakout star who hails from the Paris suburb of Bondy. The four people could face penalties of up to 11,500 rubles ($185) or 160 hours of community service. The Arc de Triomph was awash in the national colors, lit with the rooster, the faces of the winning team and the words ‘‘Proud to be Blue,’’ or French. ‘‘We say it so little ... We should be proud to be French,’’ Griezmann said. 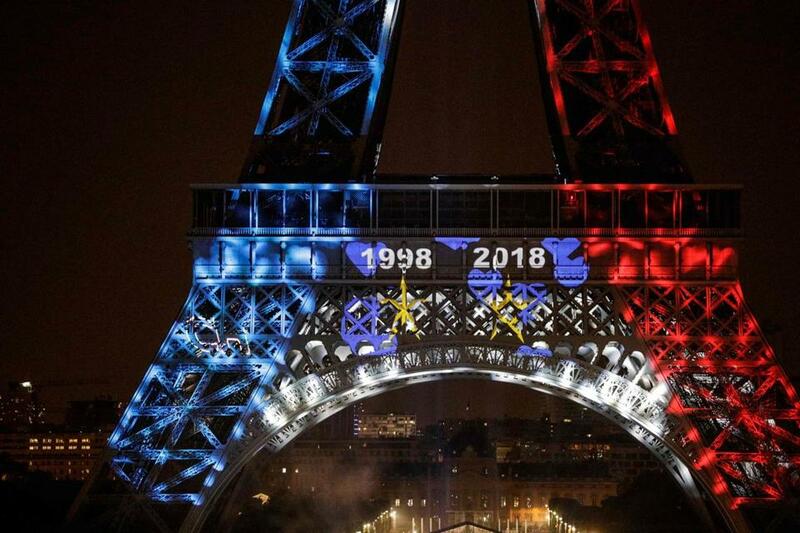 The Eiffel Tower illuminated in French national colors during celebrations after the Russia 2018 World Cup final football match between France and Croatia. ‘‘We’re happy. It took 20 years ... It’s the pride of the nation. It unites everyone. It federates,’’ Frederique Pourquet said as she and her friend left the Champs-Elysees. 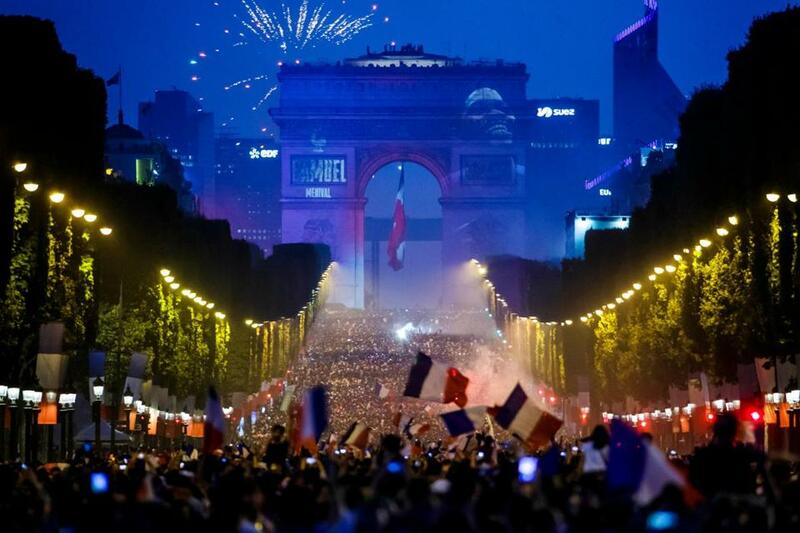 The win ‘‘shows that the French people are consolidated and the work of all France,’’ said Omar Bzi. 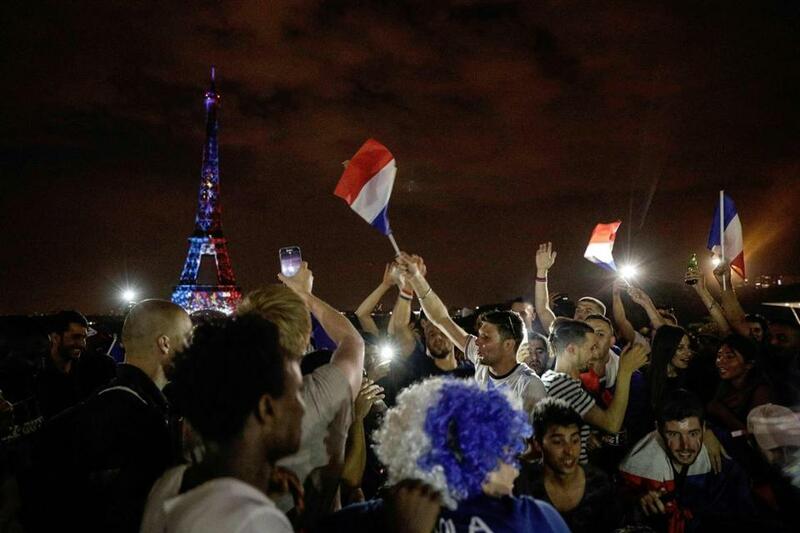 French supporters celebrated on the Place de la Republique after France won during the FIFA World Cup 2018. 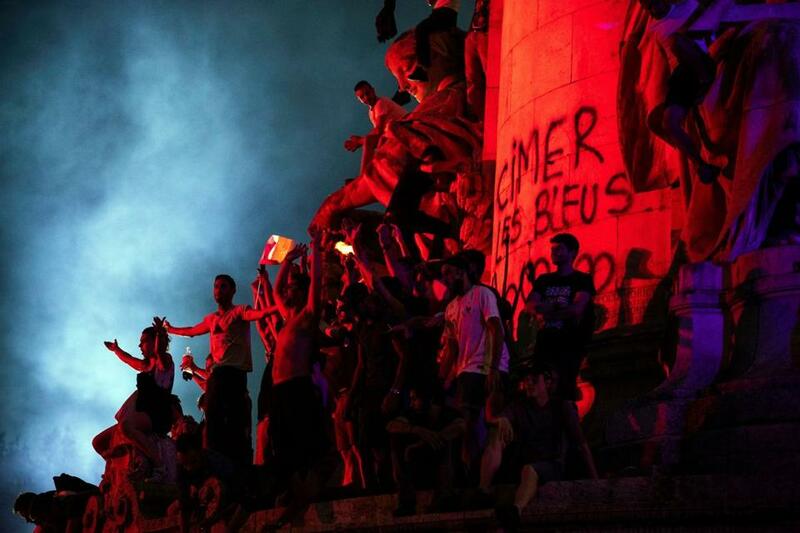 French supporters celebrated on the Champs Elysees. 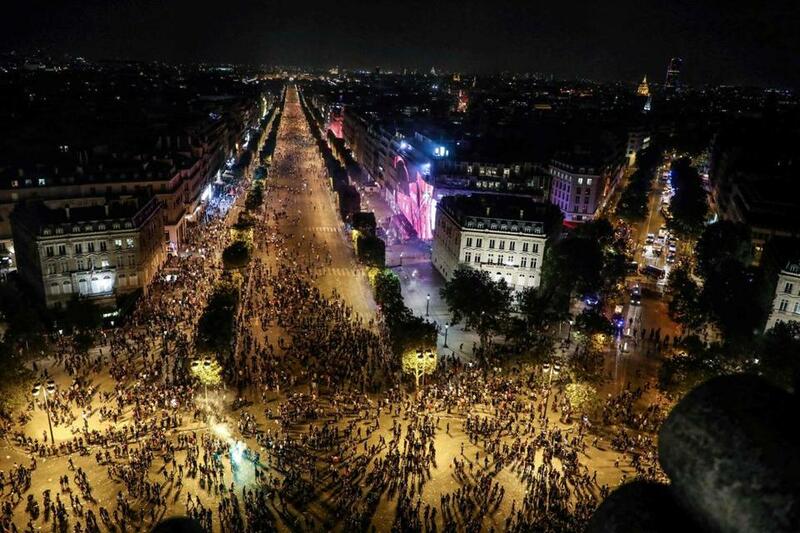 This picture taken from the top of the Arch of Triumph (Arc de Triomphe) shows people leaving after celebrations of the Russia 2018 World Cup final football match between France and Croatia. 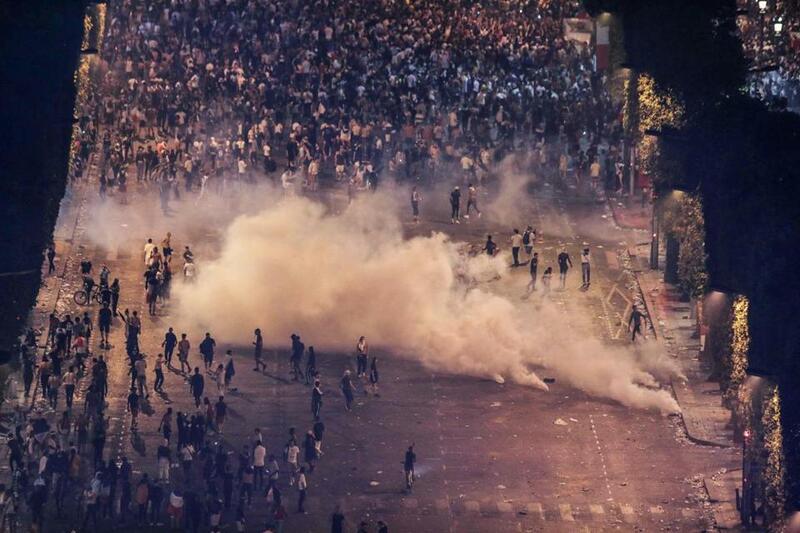 Police threw tear gas at people rioting after celebrations of the Russia 2018 World Cup final football match between France and Croatia. John Leicester in Moscow contributed to this report.